Hi There. Hope your week is off to an awesome start. 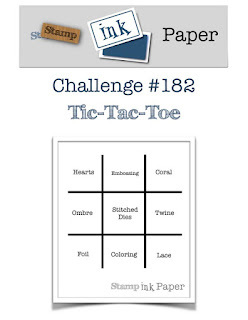 I'm here with a quick Design Team card for this fun Tic-Tac-Toe over at Stamp, Ink, Paper! I went straight across the middle with Ombre, Stitched Dies and Twine. I started with a piece of Bristol Smooth Cardstock and a Time Holtz Blending Brush and various pink inks to get an Ombre effect for the background. I used my Stampin' Up! Needle and Thread Bundle again for the background stitching and the flowers and leaves. The sentiment on the bottom of the panel was heat embossed in black. This was a really simple card. (sorry, I leave my message as a comment because I didn't find contact form on your blog, hoping you'll see it soon. Please answer directly to my email address elise.amann(at)wanadoo.fr). I'm writting an article for the issue 51 of the french magazine called "Passion cartes créatives". The subject is layering stamping to get shadows effects and using several stamps to assemble them to create scenes (vases with flowers, boces with things inside them...). 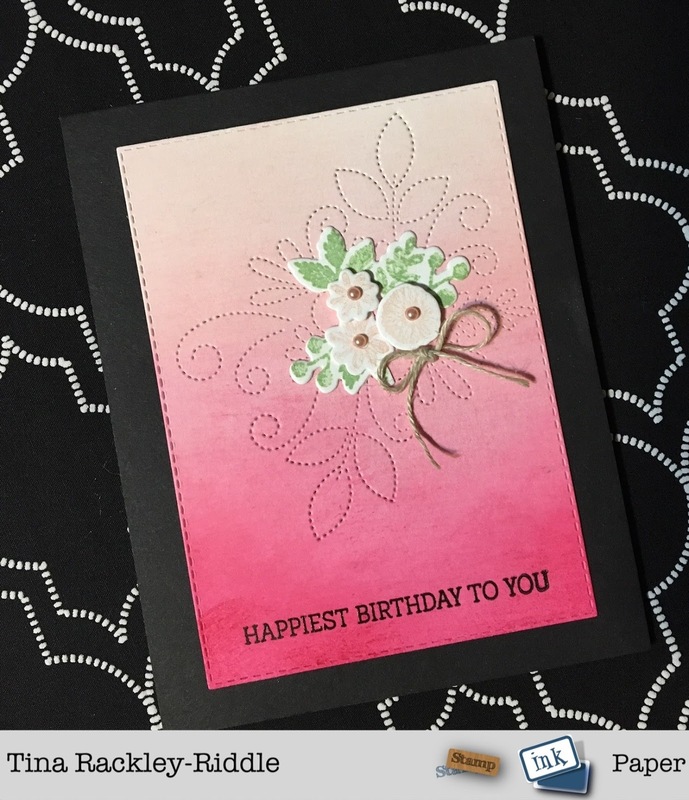 I wish to show your card (seen here : http://www.tinascropshop.com/2017/04/sip-92-coming-up-flowers-challenge-with.html) within this article. Would you agree with that ? If yes, could you please send me as soon as possible a high resolution photo of your creation ? Of course, your name or pen name if you want will appear next to the image, and the address of your blog will be in the address book. Thank you in advance for your quick answer, even if it is negative, so that I can get organized (I have to give my paper very soon).